It’s a buzz word. It’s a concept. It’s a very very good question, and I’m glad we’re asking it. Demographics, we are learning, matter to church growth. In fact, seen from one perspective, demographics are destiny when it comes to church growth. All this is good. But it is not the only question. Because, while we absolutely should be analyzing the demographic data on the micro-level of neighborhoods, we also need to analyze it on the macro-level of our nation too. What Does the “Mission Field” of the United States look like? If the United Methodist Church is going to survive in the future, it’s deeply important that we ask and answer this question, and that we seek the best data to help us with this. What are the politics of the American people? What issues are becoming more important? What issues are becoming less important? So, having set this out for us, let me jump right to the punchline and work my way back to the end…. The United States is a “center/left” nation. But the United Methodist Church is, increasingly, a “center/right” denomination. That should be of deep concern to all of us. We are, increasingly, out-of-step, with where the nation is, and with where the nation is going. We are “big ship” that takes a long time to turn, especially on social issues. We are behind. We should expect to fall farther behind in these next four years. Not because I am cynical about us, but because the demographic data tells us this. Arguably, there is no better demographic indicator for the heart of the nation than the popular vote. But what I want you to focus on today is not just what happened Tuesday, but what has been happening for years. The Republican Party has now *lost* the “popular vote” in five of the past of six elections. I know this will blow some folk’s minds. So, go and check yourself. That’s the data, right there. We tend to forget that Gore won the popular vote in 2000, because he wasn’t elected president. But he absolutely won the popular vote that year. And while folks in the past two days have said “Well, Obama barely squeaked by this year,” the facts are that he won by 3 million votes (exactly the same as Bush/2004) and 2.5 percent (slightly higher than Bush/2004). — Women favored Democrats by wide margins in both state and national elections. — So did young people of all races. — That brings to ten percent the number of states that now approve it. All of these are the fast-growing parts of our United States population. And all of this demographic data leads me to the following inescapable conclusion: Despite what you have been told for decades, we are a “center/left” nation. All I am saying is, just looking at the data, from a factual point of view, our nation is slightly to the “left” side of the fence, not the right. And these are trends that do not appear to be reversing themselves. If anything, they appear to be growing stronger. Over that same historical period (1996-Present) it would be hard to argue that the United Methodist Church has done anything but move more to the right. — On key social issues of the time, such as homosexuality, we have either kept the same language or become more conservative. — Our delegates now include an almost 50 percent African contingent, and just about everyone agrees these delegates, on average are more conservative than even most US conservative Christians. The inescapable conclusion is that over twenty years we have become socially and demographically “out of step” with America. America is multi-ethnic society (40 percent of whites voted for Obama this year), increasingly younger, increasingly embracing of women in leadership, and increasingly accepting of homosexuality. But, the United Methodist Church remains overwhelmingly white, unable to attract the young, and fearful of embracing LGBT persons in their full personhood. When seen from this hindsight of this election, the failure of the “Hamilton-Slaughter” resolution at General Conference is a colossal and tragic missed opportunity. First, we can acknowledge the reality that we are out of step. Second, we can begin to see these social movements, such as homosexuality, not as a threat, but as the genuine moving of God’s Holy Spirit in our world. It’s long past the time to admit that the theological justifications for our “Incompatibility Clause” are terribly flimsy. The Bible has far more passages embracing slavery and the subjugation of women than it does about homosexuality, pro-or-con. These questions will come to all us, and very very soon. Let those with ears hear. This is bad bad news for us, friends. As Adam Hamilton said after that vote: we will lose the next generation of evangelical Christians. Not just “mainline” ones. Evangelical ones too. But we seem unable, or unwilling, to do so at the national level. Yes, we United Methodist do need to continue to keep our eye on the international “mission field.” But not at the sake of the mission field here. “The world IS our parish.” Even America. And our parish is speaking to us with their feet and their votes, increasingly leaving us behind. I have said for years that this is not just about demographics. It’s also about the working of God’s Holy Spirit, at a macro-level, in our society. These demographics are an “outward and visible sign” of God’s inward and Spiritual grace, blowing through the nation itself. 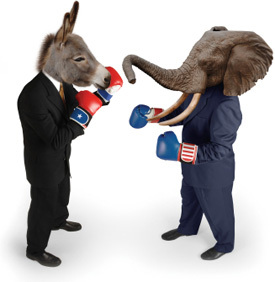 (1) If analyze Congress, you could definitely make the argument the US is still “center-right.” However, dispassionate observers on all political sides can admit that there is a whole lot of “gerrymandering” of Congressional districts…on both sides…that tend to lean, on average, toward Republicans. Please hear me: Dems have “safe” districts, drawn poorly, too. But Republicans currently have more…which makes Congress a very poor “barometer” for where the nation is as a whole. What If Christians Stopped ‘Saving’ America, and Started Loving It?